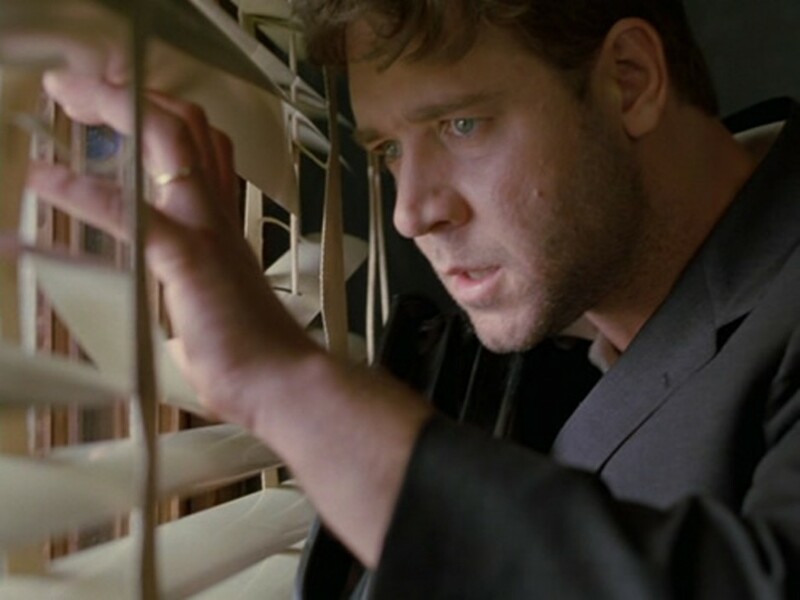 The evolution of John Nash (Russell Crowe) in A Beautiful Mind is nothing short of remarkable. In 1947, as a graduate student at Princeton University, Nash is a bold, cocky young man. He is confident in his mathematical talent, but his social skills are lacking. A flamboyant roommate, Charles Herman (Paul Bettany), helps bring him out of his shell, and eventually he fits in with a new circle of friends. Nash’s personal growth is even more successful after college, as he gets a job as a professor at MIT, and he begins dating (and later marries) one of his very attractive students, Alicia (Jennifer Connelly). And just as he starts to grow tired of his day-to-day work, he gets a top-secret offer from a high-ranking Pentagon official, William Parcher (Ed Harris). Nash is confidentially hired on as a codebreaker, with his assignment being to find and decode hidden messages that the Russians placed into newspapers and magazines. There’s just one problem. Parcher isn’t real. Nash suffers from schizophrenia, and he is constantly imagining people and situations that don’t exist. Because he believes he is part of a classified government assignment, he becomes increasingly paranoid that the Russians are after him, and this begins to greatly impact his personal and professional life. Eventually, he is taken in by a psychiatrist, Dr. Rosen (Christopher Plummer), though the treatment at this time was only shock therapy. The middle years of Nash’s life finds him struggling with his mental illness, unable to take care of his young son and also unable to work. 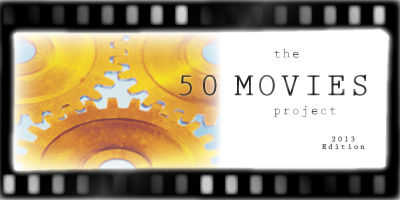 The film’s big Hollywood moment arrives later on when Nash begins visiting MIT daily, eventually coming to terms with his hallucinations and getting his job back as a result. And, to make his story even more inspirational, the man earns a Nobel Peace Prize. It’s a beautiful story, even if it does get a bit too schmaltzy at times. Russell Crowe does a phenomenal job as the very real (and still alive) Nash, and his mental illness is treated tactfully. Some bits of Nash’s actual life aren’t mentioned in the film, such as his bisexuality and his child out of wedlock, but director Ron Howard has claimed that this is not meant to be a literal representation. The rest of the performances, particularly that of Connelly and Harris, are excellent, and the acting as a whole helps elevate this film. I was curious to read your reaction as someone who is watching this for he first time. I haven’t seen it in more than 4 years but back then, I really liked this film. Now a days, I am not sure why but, it seems to have got quite a bad rep. I sort of feel guilty for liking it now. Good to have someone with me on that! As good as Crowe is and he is fantastic, I actually like Connelly better than him in this. Yeah, it’s weird that this has gotten such a bad rep lately. I guess that’s bound to happen with most Best Picture winners though. I didn’t like this one nearly as much. I think Crowe’s performance terrific, and Connelly also quite good. But the historical inaccuracies are hard to overcome, as they are in anything posing as a biopic. The shcmaltz also goes over the top for my tastes. I don’t hate it, but I also don’t love it. Thanks. The inaccuracies didn’t bother me as much because I didn’t even know about them until after I saw the film. I can understand where you’re coming from though. 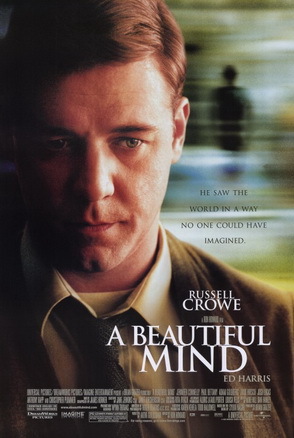 I don’t remember being blown away by A Beautiful Mind when I saw it in the theaters, and I haven’t gone back. Still, I think the acting is really strong from Crowe, so it’s hard to dislike it. I wonder how I’d respond seeing it today. It was interesting seeing this for the first time just now. I think I held off for so long simply because I heard so many negative remarks about it over the years, but I was actually pleasantly surprised with it. Fun fact: I know someone who played an extra in the film. Nice review. I remember liking A Beautiful Mind when I first saw it, but it’s been a long time. Crowe was particularly good. That’s a cool bit of trivia. 🙂 Crowe really is terrific in this. Good review Eric. This is a good movie, but not a great one. The fact that so many of this was made up for theatrical purposes just astounded me. And not in a good way, either. Oh yeah, I imagine including all of the factual details would have made the Nash character a bit less endearing. Nothing screams inspirational like having a child out of wedlock! Very nice and concise review of one of Russell Crowe’s most underplayed roles. Second only to ‘The Insider’. Ron Howard has proven to be very subtle in the ways of making calculations on either slide rule, “Whiz Wheel”, black board or glass intriguing. Which quitely support’s Crowe’s slowly losing it through the second half of the film. Thanks, Jack! I’m going to have to check out The Insider, especially if Crowe is in even better form there. I always found the movie very overrated. I thought the mix of thriller and romance really didn’t work – it’s like there are two good movies here but they don’t blend well. I did love Connelly’s performance and some of the romantic scenes. I’m not sure if this was a great choice for Best Picture, but I was surprised with how much I enjoyed the film overall. Glad you dug Connelly’s performance — she really was excellent in this. I saw A Beautiful Mind a long time ago, around the time it came out onto theaters and I remember being very impressed by it. Perhaps if I were to revisit it again I would not be as taken by it since my tastes have since evolved (or devolved) a little bit. I would still put it under the great or near-great category. Russell Crowe was simply amazing. One of his better performances at the peak of his career. I think that seems to be the general consensus — most enjoyed it at its release but aren’t so sure about it now. For me, it probably helped to have watched it without knowing any of the controversies surrounding it beforehand. Even with its inaccuracies, it is still a well made film. Great review! It’s been a while since I saw this but I remember being impressed by it and Crowe’s performance. Thanks, Ruth! Crowe and Connelly both are fantastic in this. Also, thanks for the RT! Think this is my second favourite performance from Crowe, after his role in Gladiator. The film is good, but it’s his character and portrayal that neveer fails to get me to tears!